Ah, the best laid plans of mice, men …and Janet often go astray. I had planned to write a newsletter every week during the month of April but somehow didn’t get to it. April has been an amazing month so far. 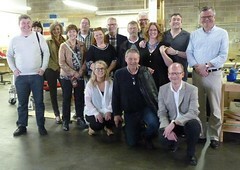 A group of program mangers from AspIT in Denmark visited Autistry. AspIT is a vocational program for ASD individuals focused on training IT professionals. They came to the Bay Area to visit Silicon Valley companies (specifically Google and Apple) and kept hearing people mention Autistry. We spent a great afternoon sharing ideas and teaching strategies. They were very interested in the wide range of projects our students produce and they loved the Studio. We have been invited to visit Denmark and we would love to put that trip on our calendar! We also met with Stacy Frauwirth, Professor at Dominican University in the department of Occupational Therapy. Over the next year Stacy and a team of grad students will be working with Autistry to develop a battery of assessment instruments to log and track student development toward the goal of independence. This will involve the creation of assessment tools and the testing of these tools. At the end of the process Autistry will have a sophisticated set of assessment tools, a revamped intake process, and the ability to collect important data. This will be very, very important for us going forward as we develop our training program and apply for larger grants. Several of our Autistry students and families were interviewed by LabZero to gather information on the creation of a new app specifically designed for ASD individuals. The LabZero software engineers spent two days at Autistry asking detailed questions about how our students use technology, what types of reminders or prompts would they find helpful, what difficulties do they have organizing their days, etc. We will continue to meet with the design team as the app is being developed. From all accounts the team learned a lot about the ASD mind! Nathaniel’s dragons are getting more and more sophisticated. He is now scanning his drawings into the computer and adding color and texture in the Paint Shop program. He has learned to use the tablet and stylus which has given him a new range of expression in his drawings. Nathaniel continues to work on his Spore World diorama of mushroom forests, dragon nests and a river running through it. George finished the jump ramp for his bike and is now hobbling around on a broken ankle! Do those two things go together – not necessarily. But he still gets around the Studio on a very cool 4-wheel scooter and is helping others with their projects. He helped Ashley with her chair and Noah with his parcour obstacle. We hope he is back on both feet soon. Daniel S., the man-of-many-projects is working on another chest armor piece – this time in hard plastic. This is based on his earlier design which he fashioned out of floor mats. This new model he is making out of a large plastic bucket. How’s that for recycling. 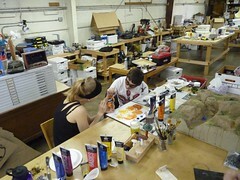 Daniel has also finished a guitar, refinished a Nerf rifle, made various launching gadgets, and …I have lost track now! Devon has taken on a wonderful sewing project – Captain Jack Harkness’ jacket (from Dr. Who). Under the expert guidance of Amelia, she is first making a mockup out of muslin that she will use to make size and shape adjustments. The muslin version will then become the pattern for the real thing. Her hard work and attention to detail will pay off! 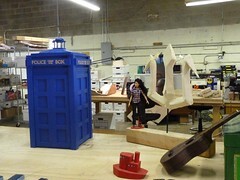 We are very happy to announce the completion of Marina’s Dr. Who Tardis. This has been a true labor of love. Marina used the band saw, the ShopBot, the router, the nail gun, all sorts of hand tools and paint brushes. In fact I think she used just about every tool in the shop. And the finished product looks great – let’s all go back in time. Ben L. is just about finished with a shield to accompany the two swords he made earlier. The shield has a silhouette of a grey howling wolf on a black background – very dramatic. 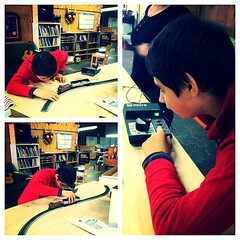 Ben has learned to sew as well as use the band saw and the hot knife. Oh, and the iron. All skills that will come in very handy one day. REMINDER: Thursday, April 25th is the last day to purchase Stella & Dot jewelry through Suzi’s Trunk Show page to support Autistry Studios. Here is the link to use to start your shopping: http://www.stelladot.com/ts/qojo5. Happy April Fools Day! As with any day at Autistry we are working hard, playing hard, and letting our inner-tricksters roam wild. It is one of our fundamental tenants that each of us creates our life given the materials available. And great lives, not just great projects are being created at Autistry! 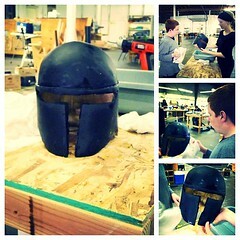 After months of hard work, Chris is finishing up his Star Wars helmet. 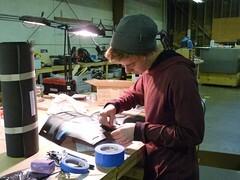 Chris has shown amazing tenacity, overcoming lots of production obstacles but sticking with it. Amelia is researching how to create a mold so that more helmets can be made using Chris’s as a prototype. Connor E. wrote a comic book story about a family picnic. 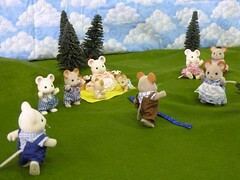 He staged the action using adorable mouse figures. This type of photo-novella is the perfect introduction to stop action film making. It also a good way to practice the art of storytelling – sequencing disparate events to create a narrative flow. 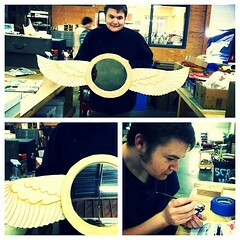 Connor B. finished his angel-winged mirror and is now hard at work on a model BatBoat. 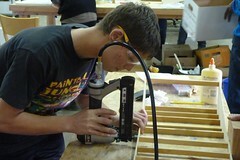 Connor used several different tools to create the wings – the bandsaw, the router, chisels, etc. And he learned new painting techniques – highlighting, dark wash, etc. And it all came together beautifully. Peter is making a very difficult Crow T. Robot to accompany his Tom Servo. You may remember these characters from Mystery Science Theater 3000. Tom Servo was difficult to build but Crow is proving to be an even greater challenge. Allison and Peter have spent hours deciphering the instructions and creating their own designs to make this project work. Learning to overcome obstacles is all part of the process. Andrew is making a Box World Diorama of an historic bedroom – complete with carpet, bookcases, and a pillow case for the bed pillow! They used several tools including the bandsaw and the sewing machine (rather similar those two machines!) Andrew and Allison make a great working pair. He has great concentration and she has infinite patience. Maya is working very independently creating plushies of characters from Homestuck. She has drawn her favorite characters and cut out fabric pieces ready to assemble. Homestuck is a web comic that combines different techniques to tell a story. Traditional drawings are augmented with animated gifs, Flash animation, and instant message logs. So cool! The trains are running for Josh! He finished detailing his Amtrak engine which included painstaking work carefully placing decals on the train. He also had to spray paint the engine first with a flat black, then with silver, and after the decals were attached he sprayed it again with a clear coat. Focus and attention to detail can come in handy when doing model work. When he was finished he set up the track to take it for a spin. 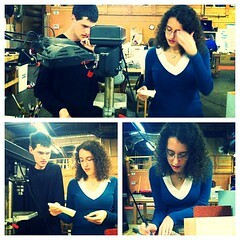 And, there is Lauren, ShopBot Queen. Lauren has certainly tamed this machine. She runs it independently, with just a little help from Dan. She has really taken ownership of the entire process of running the ShopBot from setting up the cutting bits to programming the cut files. Lauren has created several signs, a wooden box, and a cool set of gears. There is much more to come. The Autistry staff also creates projects! Ashley, who claimed not to be creative when she arrived, has become quite a talented artist. 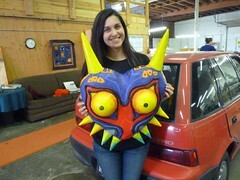 This week she finished her Majora mask. Ashley works with several of the students and is happy to learn right along with them. This is a trait we cherish. We are so fortunate to have the very talented and creative Amelia as our Workshop Lead. 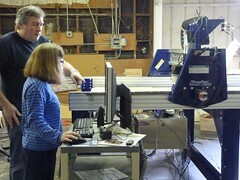 She is multi-talented, at home on the ShopBot, the bandsaw, the sewing machine and in the kitchen! Ameila recently finished a ShopBot project that is worthy of auction at Sotherbys – a fold-up stool with an antique finish. All our mentors are encouraged to create – to try, fail, and to try again. How we handle the stress and frustration of making something real serves as a model for our students. We are not flawless and we make mistakes. Those too are learning opportunities. We’ll be highlighting different workshops throughout April and May so stay tuned for more cool project news. You can also follow us on Facebook and see fabulous photos on our Autistry Instagram page.